is this a mobile device with discrete card? aka hybrid dual graphics? or a pci nvidia card inside a PC? This is a PCI Nvidia card inside a PC, I think the same but don’t know how I can update it, can you guys show me the way to try ? Where is the build system for the image at least ? @Its-Alex Is this a video card related problem? You are using an Nvidia RTX 2070 which is a very new card. From reading this it seems that you are saying you tried to launch boot from live usb and you are just getting a blinking cursor? Have you disabled secure boot? Yes I disable secure boot. Just a blink cursor and I can’t switch TTY to see logs or something else because it redirect me to blink cursor after few seconds. I already tried etcher and I have the same problem. I encountered a similar issue on my HP Elitebook 8440p (a pre-Win8 UEFI-capable laptop); what worked for me was using Etcher to write the image to my USB drive, and somewhat counterintuitively, choosing the CD/DVD option on the boot menu, rather than the USB option which would just complain about not being able to access the kernel image. USB mod doesn’t complain about kernel not found in the case I use rufus in UEFI mode but I have a black screen like I said above. And when I try in Live CD/DVD antergos doesn’t ask for a /boot/efi partition so it try to install grub on a bios partition and fail. Rufus in DD mode should also work, but I haven’t tested that. I didn’t try with rufus in DD mode I will. 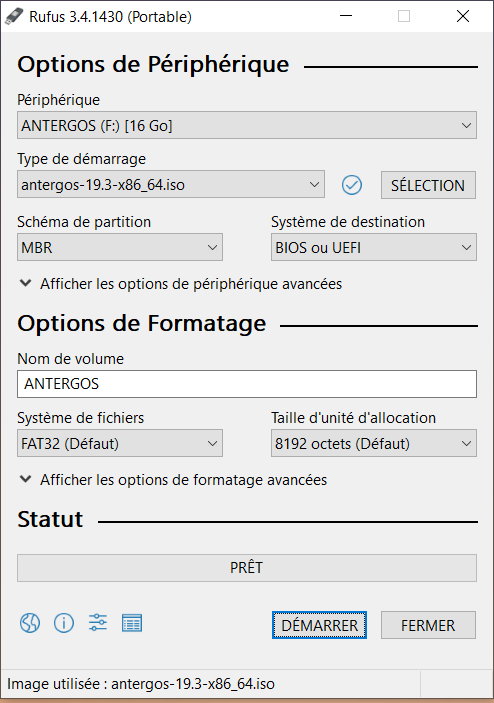 Hi, I tried to install Antergos on my pc but I can’t boot Antergos live usb with UEFI. Then when I got to screen to choose which Antergos, Live USB image boot but keep waiting on black screen with _ blinkin gin the top left corner. I tried to change TTY but it doesn’t work and redirect on this black screen. I tried to install Antergos with Antergos live CD image but it desn’t work due to my UEFI, grub can’t find a suitable place to install. I have an RTX 2070 with a i7-6700 if it can help you. Thanks for reading. Waiting for help.